Not sure what crystal you might need? Looking to stock up your parts bin? Get this package of all the most common values as well as some more specialized frequencies for your next project. We include both through-hole and SMD packages. 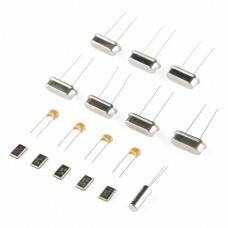 We even include some 22pF capacitors to use with the crystals.